As an established real estate agent practicing in La Canada Flintridge and the surrounding areas, Carey Haynes’ 30 years of experience and guidance have played an integral role in bringing tech real estate company Compass and its forward-thinking brokerage model to the foothills of the San Gabriels. A bona fide industry leader, Carey is consistently ranked amongst the highest-producing agents in the La Canada vicinity and the top 1 percent of real estate agents nationwide. Renowned for her impressive accomplishments, remarkable ethical standards, matchless ambition and devotion to each and every client—from the initial meeting to move-in day—Carey demonstrates unrivaled negotiation and problem-solving skills that invariably set her apart. Prior to her current leadership role, Carey was a founding partner of boutique brokerage Partners Trust and greatly contributed to the company’s growth to $11.5 billion in under 10 years, leading it through its merger with Pacific Union International to become the No. 1 independent brokerage in California. This past November, Pacific Union International joined Compass, with Carey at the helm of the brokerage’s La Canada Flintridge office. 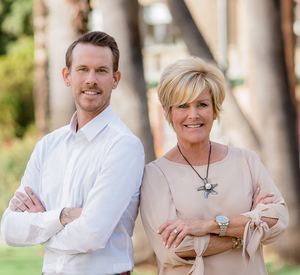 In 2018, Carey partnered with her son Andy—a seasoned fine artist, home builder, landscape designer and real estate professional—creating a new force in the industry: The Haynes Group. By combining decades of localism and hands-on experience with the forward thinking and technological sophistication of Compass, Carey and Andy strive with excitement and professionalism, guiding their clients through a changing and advancing industry with ease and understanding. After growing up in Altadena and attending school in Pasadena, Carey married her husband, Tony—an LCF native—and moved to La Canada Flintridge 38 years ago to start a family. Her grandfather purchased several properties in the post-Depression era in neighborhoods spanning from the San Gabriel Valley to as far as Sunset Beach, affording her a profound and inherent wisdom regarding Los Angeles’ eastside communities. Watching this inspired Carey’s initial passion for real estate which, in turn, bloomed into what she has accomplished today. With an eye for design, coupled with her husband’s career command of 40 years of local homebuilding, Carey was organically groomed to excel in the industry. When not giving clientele and the La Canada Flintridge team her utmost care and attention, Carey is most likely spending time with her children and six grandchildren; or, perhaps, hiking the local trails with her 90 lb Royal Poodle, Steven Tyler. Carey is likewise endlessly committed to helping the less fortunate through LA Family Housing, Union Station Homeless Services and Safe Place for Youth, and can be seen sponsoring events at Paradise Canyon Elementary and La Canada Community Center Preschool. The Haynes’ are lifetime members of the Center Circle at Descanso Gardens, too, where they take time to enjoy the beautiful grounds. Carey is able to simultaneously fulfill many roles—a mother, grandmother, realtor and philanthropist—drawing from her natural instinct to nurture. Gratitude being a daily way of life, she invites you to see the glass half full.